It is good that we have the fact checking, mainstream media to help us. 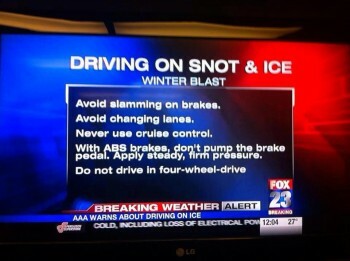 Four wheel drive actually works quite well on snot and ice. What’s wrong with driving four wheel on coke and meth? Only in deep snot. An inch of snot is very dangerous when in 4wd and negotiating a curve. Why? Because going around a curve or corner all four wheels are turning at different speeds. That slippery snot guarantees that both wheels on one of the axles will lose traction, almost guaranteeing a skid (unless it’s a “smart” 4wd system). Deeper snot, ok more or less. Or to get you moving. First snowfall of the year? Notice how many 4wd vehicles, mostly SUV’s whip on by you, only to have you pass them when they come to grief. People think they’re invincible. Excuse me, should read “snotfall”. No, but it does catch such horrible orthographic misfeasance as “plough” and “draught,” “swang” and “slank.” And it objects terribly to my travelling, even lightly, lightly o’er the sn–er–snot. I’m afraid that to rely on a spellchecker is to rely upon the weakest leaves of fescue…. Four-wheel drive helps you go, it does not help you stop. If you have any form of power going to the rear wheels (like I do) I would strongly suggest investing in a set of winter tyres. They make a huge difference. Having driven around Sakhalin Island through four Russian winters, I can assure you that it is damned near impossible to do so without 4WD. I inadvertently knocked my Toyota into 2WD once, and spent the next 2-3km desperately trying to keep my car on the road thinking there was something drastically wrong with it. And my car didn’t have traction control, just bog-standard 4WD. They key to driving in winter is make sure your car is equipped (i.e. your windscreen washers are not frozen, tyres in good nick, etc.) and to TAKE. IT. EASY! Actually, depending on the type of 4×4 it can. My Jeep is old enough to lack ABS. With the transfer case locked, one rear tire and one front tire will be turning together. In a stop this helps keep the rear tires from locking up due to the weight transfer and sending the vehicle into a spin. Granted, it won’t help if you’re going way too fast for conditions, but not much will. Considering how often I have to blow my nose these days, that typo may not be far from the truth. Now if we could just find a way to power engines with it, the energy crisis would be over.